Annie Dorothea Caroline EARNSHAW of Knaresborough, Yorkshire, England, daughter of Edward EARNSHAW & Caroline Sophie DEACON was first married to George Mildmay DARE and then after his death to G.P. OWEN. She was also a sister-in-law of Amelia Lydia DARE, wife of Sir Thomas JACKSON of HSBC. Their stories are also part of the story of why HSBC and other business enterprises experienced some of their early successes - based on the social connections which laid the ground for business connections. More of that story will be told in my upcoming book. We deeply regret to announce the death of Mrs. G.P. Owen, which occurred at her husband's beautiful residence, The Lake, yesterday afternoon. Mrs. Owen, who returned from Europe with Mr. Owen some weeks ago, had been ill for some years, and the said news was not unexpected by her friends, who knew the cheerfulness, courage and lively interest with which she met the trying conditions of illness and her inability to take the active part in local affairs which she had enjoyed for so many years. Mrs. Owen’s memories of Singapore went back a very long time, and she was a popular and prominent leader of social life here in the days before Singapore had become the busy, modern port city that it is today, and when the small European community lived much closer to town than they do now. As Miss Earnshaw the deceased married Mr. George Mildmay Dare, who was well known here for a long time, and whose experiences as a child show how real were the perils of navigation in local waters in the early days. When Mr. Dare was a baby his parents embarked upon the vessel Viscount Melbourne, bound for China, but the vessel was wrecked on the Laconia Shoal, and the unhappy parents, with two very young children, had to spend 13 days in an open boat before they reached Singapore. During that time they were captured by Lanun pirates, but escaped by cutting the tow rope at night. Mr. Dare subsequently lived in a house at the corner of Beach Road and Bras Basah Road, on the site of the present Raffles Hotel. Some years after Mr. Dare's death his widow married Mr. G.P. Owen, to whom the warm sympathies of very many friends in Singapore and throughout the country will be extended. First lady driver in Singapore. Mrs. Owen was one of the founders of the Ladies Lawn Tennis Club, which was started in 1884, when the club was still very much in the country, the Museum and houses around Dhoby Ghaut being nonexistent, and the stream running along Orchard Road between natural banks. 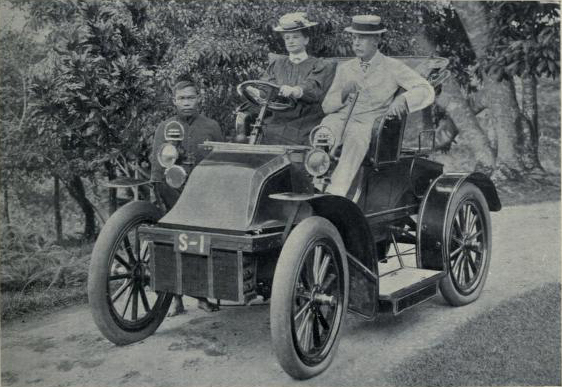 Always a leading figure in musical and amateur dramatic circles, and in the social life of Singapore generally, Mrs. Owen is particularly remembered as the first lady to drive a motor car in Singapore, and she also taught the first Malay chauffeur who obtained a driving license licence here. Her first car was a 12 hp Star, but in the following year she bought out two Adam's cars, and one of those cars received the first registration number in Singapore. It is a historic vehicle, and a wonderful testimony to the thoroughness of British manufacturing, for Mrs. Owen claimed to have covered 69,000 miles with that in Singapore, the Malay Peninsula, Java, England and Scotland. The funeral takes place today at Bidari Cemetery, at 4:30 PM. Annie Dorothea Caroline EARNSHAW, with her husband George Mildmay DARE. She is seated at the wheel of her 12 HP Star. Annie Dorothea Caroline EARNSHAW of Knaresborough, Yorkshire, England, daughter of Edward EARNSHAW & Caroline Sophie DEACON. George Mildmay DARE (1840-1907), son of George Julius DARE & Sarah Shrieve PARKE. His sister, Amelia Lydia DARE was married to Sir Thomas JACKSON. G.P. OWEN was employed with Gilfillan, Wood, and Company in 1880. Other than the fact that he was a keen amateur actor, musician, tiger hunter, sportsman and photographer, I know little about him.